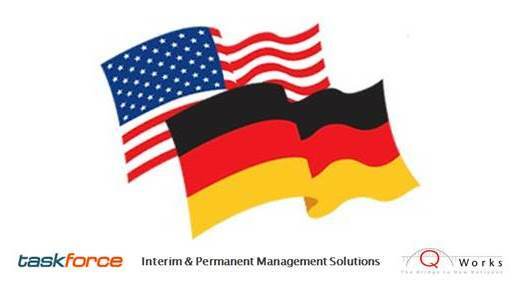 Q Works Group (http://www.qworksgroup.com), a Charlotte-area executive recruiting firm, has formed an exclusive, strategic partnership with taskforce – Management on Demand AG, Germany’s leading interim executive placement firm. The new affiliation creates an international resource for interim, project and permanent C-suite recruiting. Successful recruiting for both the corporation and the individual ultimately rests on how well people fit into the new culture. The partnership creates the opportunity for Q Works, to build on its success and expand into interim management recruiting, while also enabling the team to focus on its distinguishing service: cultural coaching. To learn more about project, interim and permanent C-suite recruiting, please visit http://www.qworksgroup.com. About taskforce – Management on Demand AG: taskforce is Germany’s leading partnership for line management and project/program management in professional interim management. Interim managers from taskforce AG take on operational responsibility for temporary tasks and strategic projects as line managers or project managers in client companies.